Don’t worry. I haven’t sold my soul to the egg and dairy devils just yet. I’ve kept this recipe vegan and as simple as possible. That way, I can indulge with half the guilt and share it with all of you. Best community birthday present ever. 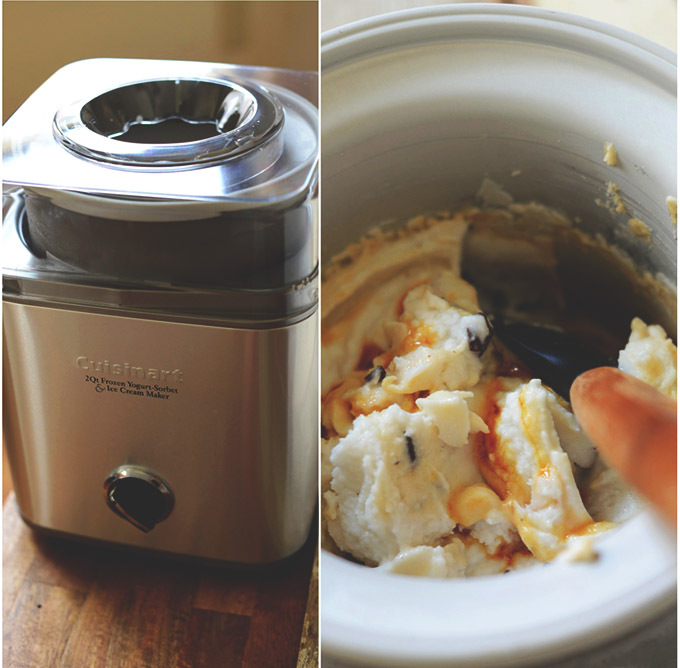 Speaking of best birthday present ever, I WON THIS CUISINART ICE CREAM MAKER in the Foodess’s giveaway! I had a suspiciously good feeling about it when I entered my name in the drawing and was absolutely floored when I received an e-mail from Jennifer notifying me I’d won! That’s it! 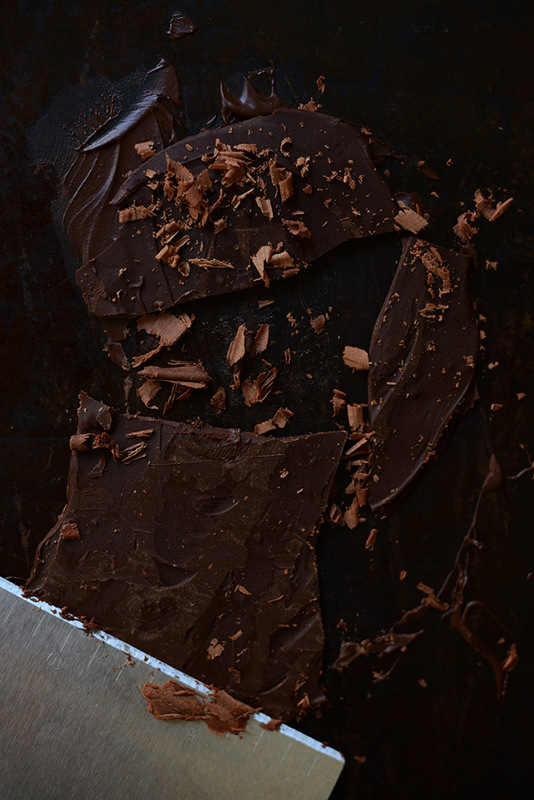 And it’s so rich and satisfying that I’d almost rather it than the actual candy bar. Or on second thought, maybe I’ll have both. Yeah, it’s my birthday so I’ll definitely be having both. Hooray! 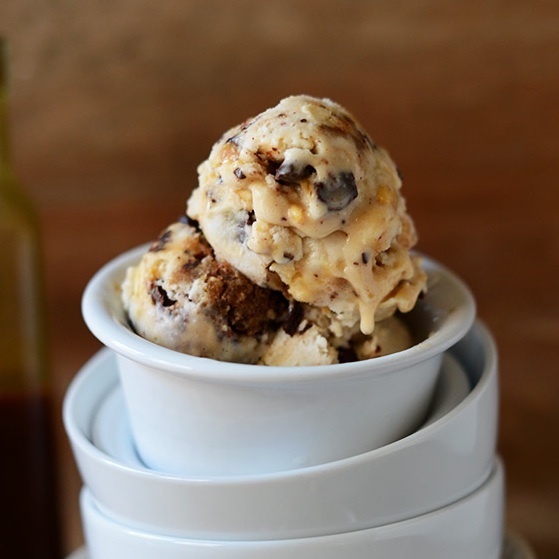 The best part about this ice cream, besides it requiring only easy to find ingredients, is that it’s fairly hands off. 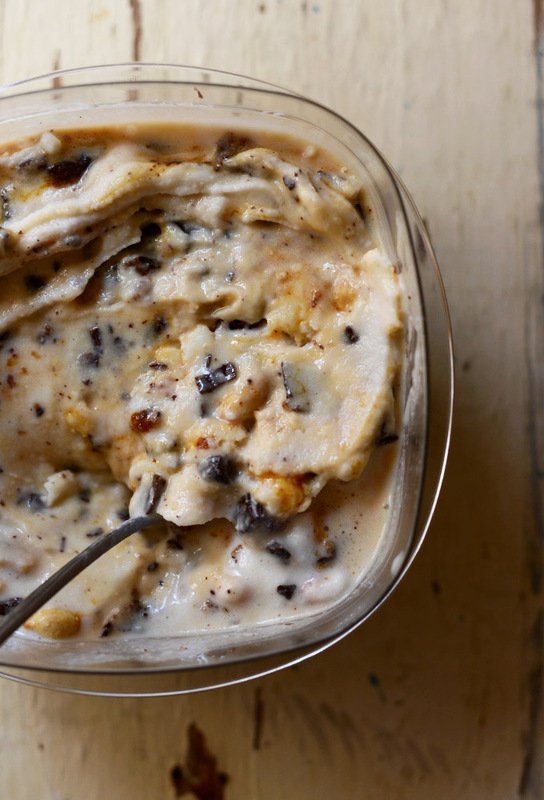 Once you combine your base and let it cool, you let your ice cream maker do the work. You can make this without an ice cream maker, but it will likely affect the texture, making it icier and denser than it would be otherwise. But if it’s the flavor you’re going for anyways it doesn’t really matter. The bottom line is: You need to have this flavor combo in your mouth, STAT. Get to churning! 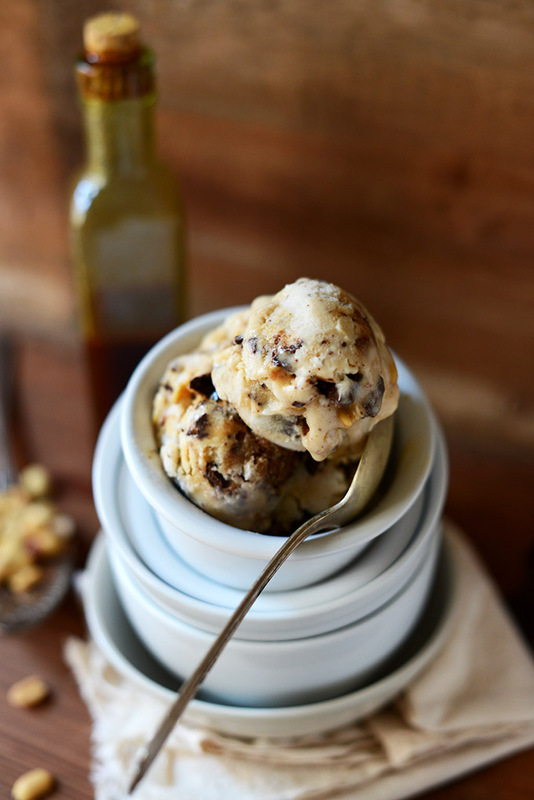 Vegan coconut milk ice cream with vegan caramel sauce, roasted peanuts, and bits of bittersweet chocolate. Remove mixture from heat and stir in the vanilla extract and xanthan gum. Whisk to combine. At this point you can either consume it soft, or pop it in the freezer to harden. It should keep fresh for about a week. Thaw for 10-15 minutes before serving. *For those curious, this is the ice cream maker we now have (on Amazon). Hi! Just a quick question! I have the exact same ice cream machine and yesterday it was the first time using it. I was wondering if you also have same problem I had with it. Lots of rock hard ice cream were stuck to the sides of the bowl after churning… The ice cream was delicious!! but I was curios to see if that problem could be avoided somehow!! So when the churning bowl is really cold it can promote firmer ice cream on the sides. So I generally just let it set out for a while to thaw the remaining ice cream, or use a pie server or something thin to shave the hardened ice cream from the sides. Hope that helps! I will try to do that!! I was just curious to see if this was something that was happening to me only! Good to know I was not doing anything wrong. Coming back to say thank you for the recipe. i made this last Saturday for my princess, she totally loved it..
this may seem like an odd question, but do you actually taste the coconut (seeing as you’re using coconutmilk)? because I really don’t like coconuts… sorry for being a bother… And would it be possible to use almondmilk instead? It does taste a bit like coconut milk. If you’re looking to do a different base, I’d recommend cashews over almond milk because almond milk will make it a big block of ice (not enough fat content). 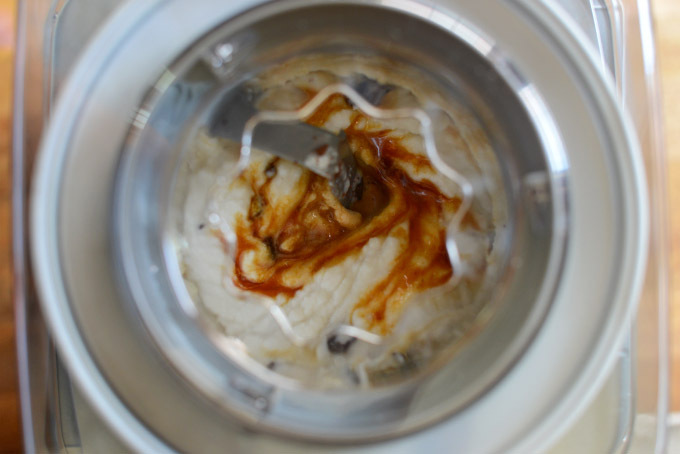 See my vegan chai ice cream recipe for that method. Hope that helps! Unfortunately, I cannot have dairy and soy is also, for the most part, a no-go as well. This ice cream was delicious. Thank you so much for posting! Hey there. I am sharing this on my fan page right now. I shouldn’t — my readers are not going to be happy :). My kiddos have been BEGGING me to make this for them for a week……Take care! Thanks Adrienne! I appreciate it! Hope I can be your food tester. Yummy! I missed your bday while I was on vacay – HAPPY BIRTHDAY LOVE! Happy birthday! What a wonderful way to celebrate. 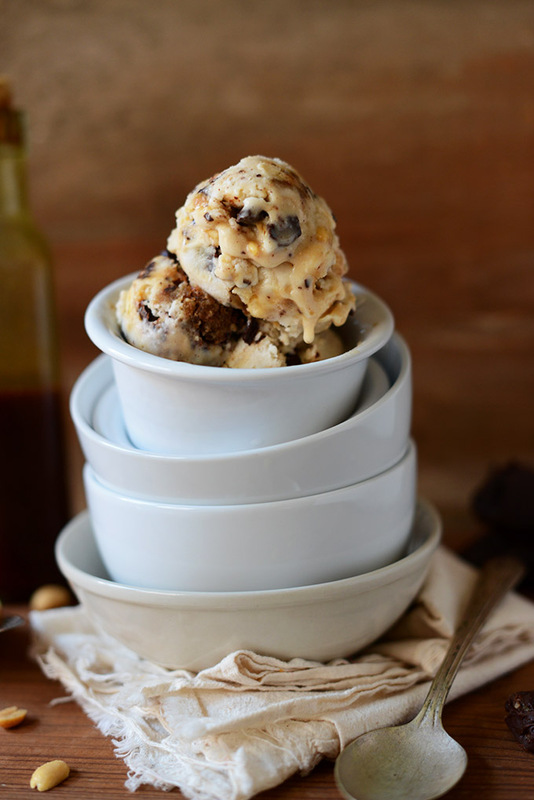 And those swirls of caramel – SWOON! 3. HAPPY BIRTHDAY. belated, but 27th bdays call for multiple day celebrations (that’s what I’ll be telling myself next month). hope the actual day was great and that the celebrating continues this weekend. blessings for a new year!! Love this ice cream, looks so good! Congrats on winning the ice cream maker! That must have been a great birthday present, along with this incredible dessert. Snickers bars were my fave chocolate bar as a kid and I still love the salty peanut chocolate combo. Happy birthday! Ice cream is a great way to celebrate. Happy birthday, Dana! This looks so wonderful! As always, your photos are gorgeous as well. I’m so impressed with every post. Ha! I kinda try and keep my ice cream recipes veg-friendly. I totally ate Dairy Queen last night though! Just have to keep such indulgences to a minimum :D Thanks again for the ice cream maker. Kinda made my month! Oh wow.. this looks amazing! 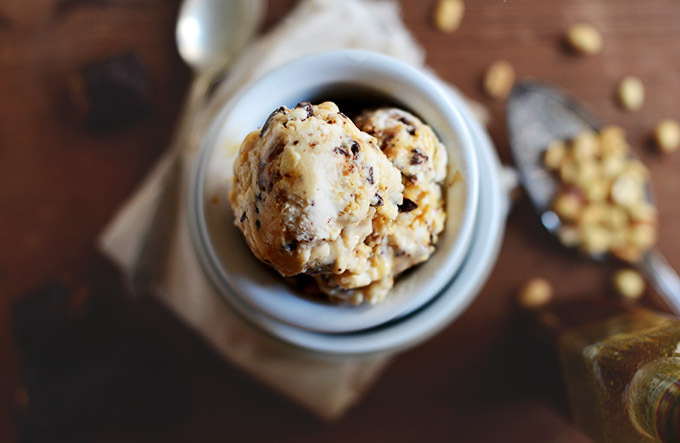 I don’t have an ice cream maker but I think even without one this would be amazing! Oh my gosh, yum!!! Happy late birthday!! Happy Birthday and thank you for this!! I feel like it is my birthday with this recipe. I mean come on? It is crazy awesome. Like crazy, crazy awesome!! I love it! I need to find a way for this to appear in my kitchen this weekend – heaven! I can’t believe it’s vegan! It sounds like the most amazing ice cream ever! You had me at snickers! I love the ingredient list, too. I think it’s time to break down and buy an ice cream machine! !